The average American possesses and hands over a great deal of personal information: credit card numbers, social security numbers, passwords, etc. Unfortunately, scammers recognize how much personal information is out there and see a booming business opportunity. These thieves are crafty and they can get your information from you before you even realize it’s gone. The FBI says that “senior citizens especially should be aware of fraud schemes.” The bureau notes that senior citizens are likely to have their own homes and excellent credit, which makes them a great target for con artists. 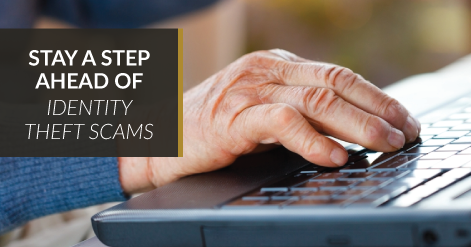 Seniors are also less likely to report fraud. Here are a few do’s and don’ts of protecting your personal information – online and offline. Anti-virus software is a valuable tool to ward off people trying to steal your identity. Although it is not a cure-all, anti-virus software will block against most viruses and will alert you when you are on a hazardous web page. Some newer computers come with this anti-virus software, but make sure you double check anyway. Don’t wander onto the web without it. For accounts like the one you have on a banking site, you should have something more secure than a password: a passphrase. Rather than a code centered on a single word (fido123), a pass phrase includes a memorable sentence fragment (44Ericwenttothestore33). Passphrases provide an extra level of security for your online accounts by making your login information significantly harder to decode. You never know what scammers can use to steal your valuable information. The information they need could be in a letter from your bank that you threw away. Shredding mail is only way to completely close off this possibility. Scammers have numerous techniques for taking advantage of the healthcare system. It’s important to never give your Medicare number to anyone you don’t trust. Scammers may offer you free medical equipment or other medical products in exchange for these numbers. See more tips on how to protect yourself and your loved ones from healthcare and health insurance fraud on the FBI’s website. Phishing, a common Internet scam, happens when a phony email asks for credit card information, a social security number, login passwords, or other sensitive information. The email will appear to be from a legitimate party, such as your bank or a government agency. The best policy is to ignore these suspicious emails. If you have a feeling that the sensitive material being requested is something you might need to turn over, get a representative on the phone. Phishing can also happen over the phone– it’s called vishing. Scammers will act like they’re from banks and insurance companies, like phishing, but some pretend to be family members as well. Perhaps they know a college-aged relative’s name or where they go to school. They will pretend to be this family member over the phone. They may act like a family member that’s in trouble on a vacation. There are some web pages you’ll stumble across that will turn red and alert you that you have been infected with a virus. Exiting out of the web browser will be extremely difficult and a pop-up with a support phone number will appear. The pop-up says that the person you call on that number will help you get rid of the virus. Do not call the number. Tech support scams are rampant on the Internet. These scam artists will usually ask you to hand over your credit card number in exchange for removing the so-called virus. Your best course of action is to restart your computer. After it has rebooted, do a quick scan of your computer with your virus software, which will likely turn up negative. For more tips, visit this resource from the Center for Identity Management and Information Protection.